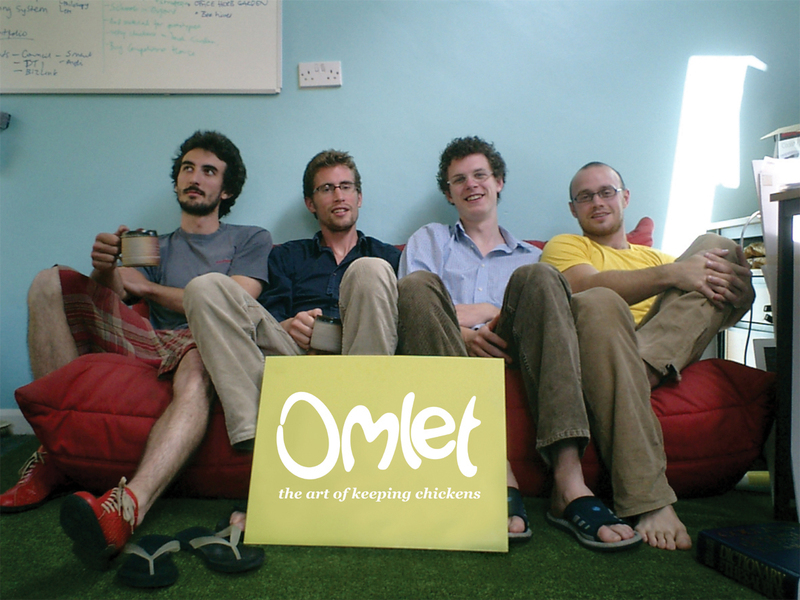 Hello,Can you believe it’s been a decade since Omlet began? The Eglu Classic was launched back in 2004, by four friends who met while studying at the Royal College of Art. 10 years on and (between you and me) they may be looking a little older and more worn, but the Eglu remains as fresh and funky as ever. Since sparking a sensation in urban chicken keeping, Omlet have delivered Eglus to households across Europe and America, and introduced thousands of families to the joy of keeping hens and the taste of freshly laid eggs. We hope you’ve henjoyed the journey as much as we have, and we’d like to eggspress our thanks for being such a fantastic bunch! Yellow Eglu Classics Back in Business! What do Eglus, custard and daffodils have in common? They’re all yellow! That’s right, the yellow Eglu Classic is back with a bang, and looking better than ever before. It’s been a long time since we saw our old friend, and we’ve missed the bright and sunny shade of chicken coop, so, what better way to celebrate Omlet’s 10 year anniversary than by bringing back this cracking colour, and reuniting the original Eglu traffic light trio!? At long last the Green, Red and Yellow Eglus can nest in harmony and house lots of happy chickens. Spring is the perfect time to start keeping chickens, and there’s nothing more Spring-like than a bloomin’ beautiful yellow Eglu. You’ll be collecting fresh eggs in time for Easter (and that beats chocolate for sure). Order yours today and you could start your dream of keeping hens with just the cluck of a button! 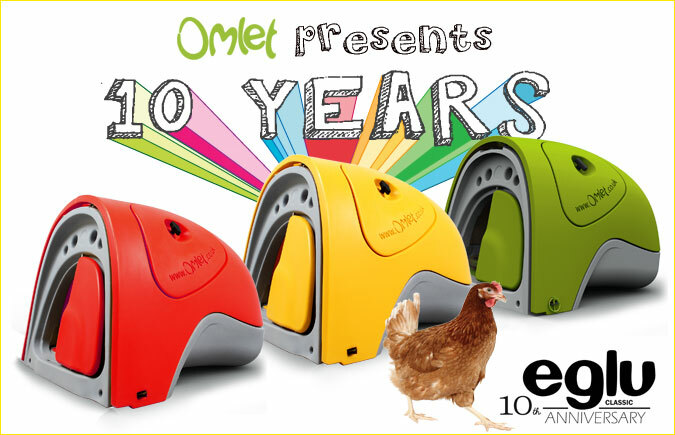 To celebrate 10 years of the Eglu Classic, we are eggstatic to unveil a new coop. It may be smaller than our other chicken houses, but what it lacks in size, it makes up for in absolute all-round awesomeness. Introducing the Eglu Egg Cup – a miniature replica of the original Eglu Classic, for your boiled egg! It’s cute, it’s cool, it’s iconic: the 2014 must-have breakfast eggcessory to add to your collection. (Please note, Omlet can not be held liable for any crockery kerfuffle caused by egg cup envy.) An 1/8th scale replica of the Eglu Classic, this may be too small to keep real chickens, but it is the perfect size to nest a beautiful boiled egg. Available as an Egg Cup, or as a Breakfast Set complete with toast rack run and salt and Miss Pepperpots, this is undoubtedly the only egg coop of its kind, and with five colours, you can choose one to match your real Eglu. The Eglu has been eggsibited all over the world and now you can display a little piece of design history right in your kitchen. Perfect for enjoying the simple pleasure of eating a boiled egg in style! Pre-Order your Eglu Egg Cup for £9.99 or your Eglu Egg Cup Breakfast Set for £19.99! 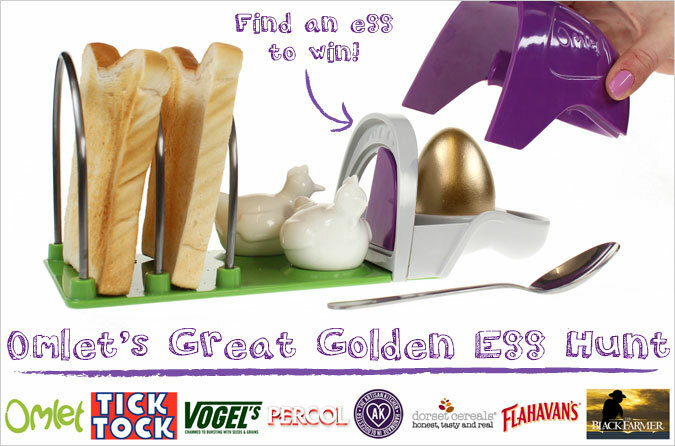 Join in Omlet’s Great Golden Egg Hunt & Win Your Breakfast! Thought that was all eggciting enough? Well the fun doesn’t stop there. Spreading a bit of Willy Wonka magic, we have hidden 100 golden eggs in the first 1000 Eglu Egg Cups and Breakfast Sets, each relating to a breakfastastic prize. 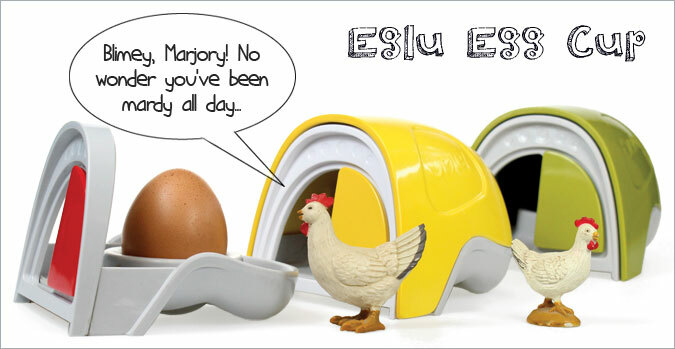 Will you be the lucky winner of a real Eglu Classic Chicken House and be treated to fresh eggs for breakfast every day? Maybe you’ll win a jar of delicious marmalade to spread on your toast? Or you might get your mitts on a lovely loaf of seeded bread to henjoy with your boiled egg. There are lots of other speggtacular prizes on offer too, and you’ve got a 1 in 10 chance of winning with every Eglu Egg Cup. So what are you waiting for? Pre-Order your Egg Cups now to join in Omlet’s Great Golden Egg Hunt! 10 years of Omlet!? 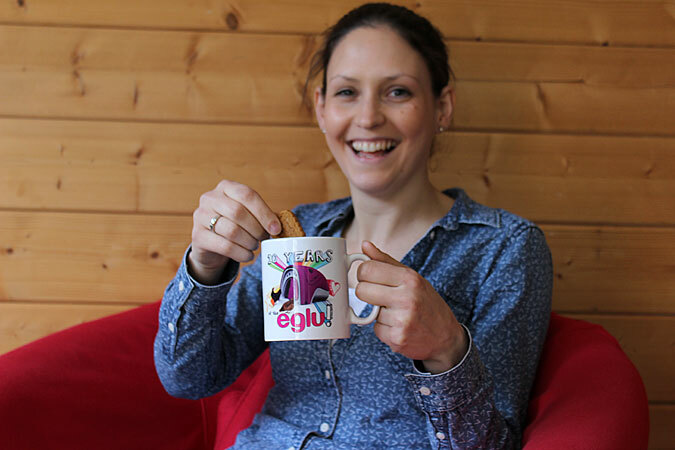 This calls for a celebration, so why not raise a toast to the Eglu Classic with our special edition anniversary mug. Whether you opt for a quintessentially English breakfast tea, or a generous helping something fizzier, enjoy a celebratory cuppa with us! 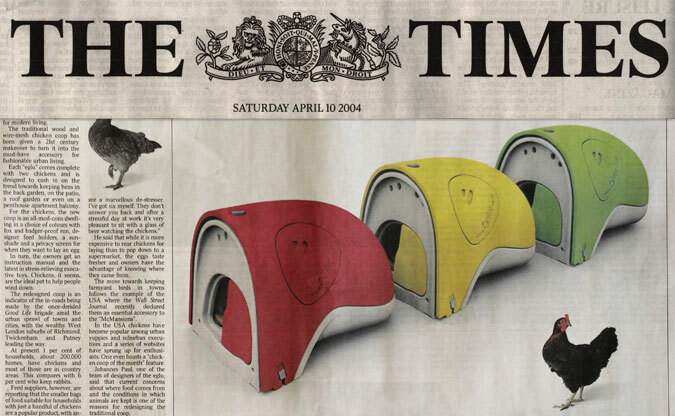 Complete with a snazzy graphic of the original Eglu Classic and a quote from the first Eglu article, featured in The Times in April 2004, this is the perfect memento for Eglu owners and Omlet fans all round. Prefer to celebrate with a spot of shopping? Spoil yourself with a new pair of shoes, a glitzy frock or a bottle of champers, and use our stylish matching bag to carry your goodies home. Funky and sustainable, it’s a great eggscuse to treat yourself. Order your Omlet 10 Year Anniversary Special Edition Mug and Bag today!